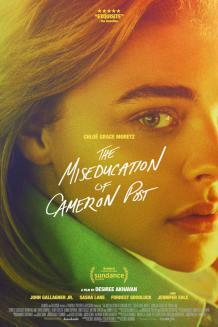 “The Miseducation of Cameron Post is loaded with terrific performances all around and, under the skilful stewardship of director Desiree Akhavan, it’s a well-crafted story steeped in poignancy, melancholy and simple truths. “It’s 1993 and Cameron (Chloe Grace Moretz) and BFF Colly get caught in a post-prom make-out session in the back seat of her date’s car. Her well-meaning aunt sends her off to God’s Promise, where “gender confusion” is weeded out by “ex-gay” Rev. Rick (John Gallagher Jr.) and his psychologist sister Dr. Lydia Marsh. “Besides assembling a great cast, Akhavan demonstrates fine instincts in catching the nuances and subtleties found in unguarded moments as Cameron and the young charges say what they need to get by but show what they’re really feeling.